Sure, you know cloud computing. You also know a bit about so-called “private clouds,” which enterprises and government agencies are exploring as an option to combine the power and scale of virtualized cloud architectures with security and control over data. But what do you know of Cloudlets? They may just be a key to the future of mobile computing. That’s a possible conclusion from the results so far of a Microsoft Research family of projects called MAUI, short for Mobile Assistance Using Infrastructure. The MAUI approach is to enable a new class of CPU-intensive, and data-intensive, applications for mobile devices – but enable them in a new way. Today’s mobile devices can’t run such apps, at least not well. And if they stick to the cloud they may never do so. I’ve just read a fundamental MAUI paper published last month in the IEEE’s Pervasive Computing journal: “The Case for VM-based Cloudlets in Mobile Computing” (November 2009, co-authored by MSR’s Paramvir Bahl along with colleagues from Carnegie Mellon University, AT&T Research, and Lancaster University). The paper is worth reading just to get a reality check on the current cloud mania in popular technology; topics include: The Limits of Cloud Computing; Why Latency Hurts; WAN Latency is Unlikely to Improve; and Bandwidth-Induced Delays Also Hurt. And we can’t rely on the magic of cloud computing to deliver better resources. In short, it is unfortunately inescapable that “long WAN latencies are a fundamental obstacle… Even trivial user-application interactions incur these delays in cloud computing.” And beyond those trivial apps, we already have mobile apps trying to deliver advanced, computation-intense capabilities like speech recognition, NLP, assisted vision, machine learning, and augmented reality. Those apps suffer because cloud computing isn’t powerful enough to support them seamlessly across a WAN like the public internet. Cloudlets are decentralized and widely-dispersed Internet infrastructure whose compute cycles and storage resources can be leveraged by nearby mobile computers. A cloudlet can be viewed as a “data center in a box.” It is self-managing, requiring little more than power, Internet connectivity, and access control or setup. This simplicity of management corresponds to an appliance model of computing resources, and makes it trivial to deploy on a business premises such as a coffee shop or a doctor’s office. Internally, a cloudlet may be viewed as a cluster of multi-core computers, with gigabit internal connectivity and a high-bandwidth wireless LAN. That sounds a lot like typical WiFi scenarios, doesn’t it? Mobile devices and their users have already become attuned to the hotspot paradigm – it might be interesting for that to be extended to hotspots of dense computational resources which light up your handheld or goggles and transform them from normal devices to immersively augmented supercomputers. There’s much more work to be done, on technical issues like dynamic VM synthesis and on figuring out the business model for cloudlets. As the paper’s authors muse, “Is deployment driven bottom-up by business owners installing cloudlets for the benefit of their customers, much as they install comfortable furniture today? Or is it driven top-down by service providers who share profits with the retail businesses on whose premises cloudlets are deployed?” These are fascinating questions which have puzzled ISP’s and wireless providers for a decade now. I’ll certainly follow up on the cloudlet progress in Microsoft Research in future posts. Thanks Lewis, this certainly gets the thoughts going. I appreciated the summary and context. Thanks Bob. Gives new meaning to “data center in a box,” a concept you and I have discussed over the years. I thought you’d like the thin-client aspect. Sir, we have taken up “vm based cloudlets in mobile computing” as our final year project.. It will be helpful if i can contact you for certain implementation details. Is the project feasible?? complexity?? steps to be followd while implementation? 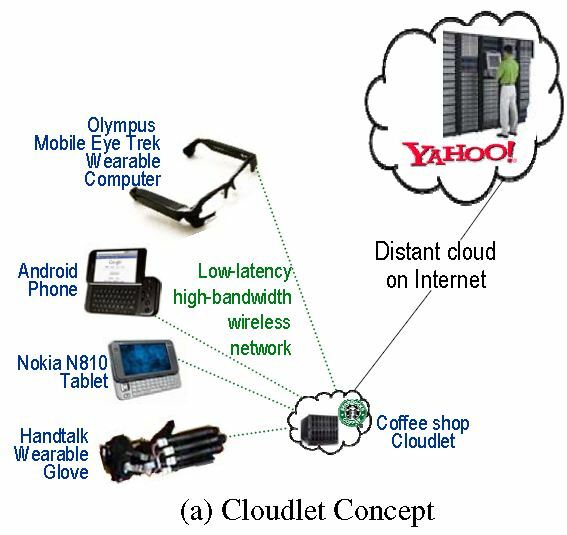 Hello sir…i m also giving VM based cloudlets as Technical seminar in my clg…i m not getting the concepts from IEEE paper.Can u give some references for understanding the cloudlet concept or can u help me..?